There is more information about Lorelei Wakefield, Andrew Knight, and Jean Hofve on the episode page for the last episode, “Cats: Can They Be Vegan?”. Since then, Lorelei Wakefield’s site, vegetariancats.com, has returned, and there’s lots of information there. She is also conducting a new study, with a focus on the urinary tract issues we discussed in the last show, and is asking cat owners to complete her survey and share medical records. Erin can be found at Tumblr (currently), ErinRed.com (under construction), and @ErinRed on Twitter. She mentions a discussion about the ethical dilemma of vegan cats with Prof Gary Francione in a February 2012 episode of Red Radio, and quotes Hamlet. Eric Weisman is the Chief Executive of Evolution Diet, manufacturers of vegan foods for cats, dogs, and ferrets, in St. Paul, Minnesota USA. He also posts at WeismanNutrition.com. Advertisements in connection with Respondent’s [Mr Weisman’s] pet food business which identify Respondent only as “Dr. Eric Weisman” and from which a reader could reasonably infer that Respondent is a veterinarian instead of a chiropractor. The advertisements admittedly issued by the Respondent also include claims that his treatment programs for animal and human disease have “good long-term results in most cases.” During his January 9, 2001, conference with the Panel, the Respondent stated that he defines a “good long-term result” as an instance in which an animal using his products and/or treatment programs survived longer than was originally predicted by a veterinarian. Because the Respondent’s definition of “long-term is contrary to its common dictionary definition,” his claims about “good long-term results” also are false and misleading. The Respondent has disseminated advertisements in which he claims his research or the research conducted by his pet food company proves dogs and cats can live 20-25 healthy years and thereby implies that the use of his products lengthens the life expectancies of animals. He admitted, however, that he does not have a dog that has lived 25 years, he did not conduct any actual research other than calling about 30 veterinarians, and he was not referencing animals that had used his products, the Respondent admitted during his conference with the Complaint Panel that this claim is “just an assumption” on his part because he distributes the food throughout the United States. This claim is false or misleading because the Respondent has no actual data or information to support this representation. His claims about animals’ life expectancies, therefore, are false or misleading. He has also been criticised by blogger SkeptVet. Ida Fong on Animal Voices podcast and Dan Robinson who runs the Vegan Cat Institute website both offer strong anecdotal criticism; whereas the majority of Amazon reviews offer positive anecdotes. … go to Robb Masters for the music, to all the interviewees, and Erin Red. 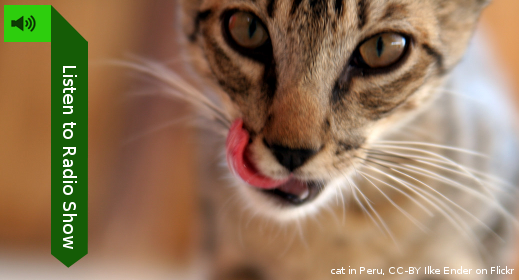 The illustration is a cat in Peru by Ilke Ender on Flickr, used under a CC-BY licence. ( vegan cats,an interesting topic). I would like to make a comment. I believe people ( especially those of us on a vegan diet and on the vegan lifestyle journey) should be discouraged from keeping cats. (especially from getting a cat ,when already taking the vegan journey). The same could be said for dogs unless rescued and encouraged to eat a vegan diet. – I believe at one point you stated that all the cats in the blood test portion of my study were on Evolution Diet. Actually, it was mixed among Evolution, Vegecat, both, and some were fed additional human vegan food. – There is also talk about pet food being a by-product of the meat industry. While this is true in some brands, many of the higher quality pet food brands use higher quality cuts of meat. This means that animals are being slaughtered specifically for that pet food. – While I mention potential sources for error in Dr. Freeman’s study, that doesn’t mean that I don’t believe her results. Those factors were pointed out in the study itself. The research was very important and we should take heed. I’m merely saying there’s a possibility that the samples tested were not representative samples. And as you point out, since then VegePet realized an error and took action to correct and improve their quality assurance. – I listened with great interest to your interview with Eric Weisman of Evolution. I just want to mention that there are also other vegan cat food companies such as VegePet (James Peden) run by caring and trustworthy individuals. While producing perfectly objective journalism is near impossible, I think it is wonderful that you tried to present a balanced argument. Thank you so much for giving this subject your attention. Thanks for your gracious comment. It was really good to have your expertise in the show, and I’m sorry if you feel some bits were skimmed over. What were the cats in the study eating? Thank you for noticing and correcting this. The error crept in during a redraft. That statement is even followed by a clip of you talking about the study that makes it clear that some cats were on Vegecat. When I next set up the studio, I’ll replace my cue. I think that Erin and Jean both make similar points. I’m not sure if you wish it was dealt with differently, but in half an hour, not every sub-topic can be dwelt on and explored. Your philosophy on what a cat with a conscience would do was heard, challenged, and we moved on (although I think most of what you said to me about the subject made it into the show). If Dr. Freeman had granted an interview, I would have used audio of her describing her own study instead, because it’s better to have a scientist describe their own work if possible. When writing a sript, it’s perhaps too easy to pull together the sides of a case by saying “On the one hand X, on the other hand Y”. Particularly if different people are stating the different sides, it’s easy to accidentally make the discussion sound more polarised than it really is. I’ll pay more attention to that. Apart from Evolution, I didn’t mention vegan cat food brands unless they came up naturally in the story – which they did, several times. I didn’t go out of my way to list brands because I try to make this show for a global audience, and not all cat foods are available everywhere. Evolution, for example, isn’t available where I live in London. I was tempted to say “Other vegan cat foods are available” after the Evolution segment, but I thought it was too much of a barbed comment, and a bit of a Brits-only joke. Jed Gillen’s excellent book ‘Obligate Carnivore’ (he got advice from veterinarians and scientists) explains that 1. artificial taurine is added to meaty commercial cat food – so presumably it doesn’t contain enough! and 2. modern veg*n cat foods contain taurine and a good balance of other nutrients to replace meat. The main thing is whether the cat will take to it! Young cats may do, others will do their feline sneer and refuse it, but it’s got to be worth a try. Dogs are more likely to take to it and do very well indeed tho I also know of some cats. I’d advise anyone interested in this issue to read Gillen’s book – he makes some interesting points, such as harm-reduction – ie it might be possible to feed a proportion of a cat or dog’s food vegan even if they don’t take to it entirely. As to ‘natural’, well, I’d argue that we have too many humans and also domestic animals on the planet; not a particularly natural situation! Each uses up massive resources and their meat consumption causes endless suffering to animals and the environment. Here’s a simple and easy choice for you. If you don’t want to feed your dog or cat a biologically appropriate diet then don’t adopt a dog or a cat. Both are biologically Carnivores. No, a dog is not an omnivore as you’ve been told. Scientifically and Biologically it is classified as a carnivore for a reason. It’s teeth, inability to manufacture amylase in the saliva, high acid pH, and mouth full of sharp teeth all prove this is a true carnivore. Want to see a true omnivore? Go visit a bear in the wild. The dog will eat some plant material in the wild because it receives amylase from the prey it kills. Therefore, amylase is no issue. However, dogs fed a standard, crappy, dog diet receive no amylase and are force to create this amino in their pancreas: which puts an incredible strain out their bodies. This information is freely available but most of my vegan friends do not wish to come to terms with this. The reason is simple. Dog food companies are continuing to lie to people and call them omnivores? Why? Look at the filler in almost every dog food. What is it? Corn or Wheat, which are both highly, indigestible grains. Again, this is because dogs do not produce amylase at the point of entry to help them break down plant matter. This means the grains go down slowly and literally ferment while the pancreas creates an emergency supply to digest the food. We, as herbivores, do not have this problem. So, if you don’t want to feed your dog meat, don’t get a dog. They don’t thrive on a plant-based diet. Therein, is the lie. They only survive. Ying my cat is really healthy and has been really healthy for a long time. I have never meet any cats who didn’t get ill in some way at some point, to imply that all meat eating cats are magical and never lose fur when ill is strange to me. I should of made it clear she had hair thinning on her tail, she had not lost all her fur. On her tail at the base it was more noticeable, she didn’t lose all the fur on her tail. She still had hair all over her body, her hair was thinning slightly around the areas where the flees had been biting a lot, I wasn’t sure what was going on at the time, but it was during a season when flees where recorded at a record high, so it really took a toll on her. I was trying to feed her some flee tablets but later I realised she had been spitting them out on the floor. And so I got some good stuff, and that worked. The hair patches went. She had been fed a year before that on a vegan diet all though one summer with no problems. It just happened to be the summer with high flees when she got skin problems. I didn’t treat her like a lab experiment. I looked in to what she needed and I made sure she got it. I did the same for my own health. She needs Taurine I make sure she gets that as part of her diet. And she does better than most cats now, so long as I put flee drops on her during the warmer months. However there is always times when a child or animal gets ill and it’s an outside cause you didn’t expect. In this case for my cat it was flees, not her diet. I did a lot of research to work out what was wrong. I wanted my vet to give my cat the same treatment as other cat owners. You don’t see vets asking to make sure the meat cat food most cats eat has not been put in a centrifuge and had loads of chemicals put in it to kill bacteria which could cause her real health problems. No because a vets job isn’t to be a dietitian for the cat, it’s to work out what is wrong with the cat and I wanted them to focus on this, rather than just jump to conclusions, if they could not understand what was going on I would have explained about diet but they said it was defiantly flees. I said ‘it’, referring to my cat, because I could not think of a better suiting word to use, and it was a fill word, not a word to be focus on. I use ‘it’ to refer to animals in general. I don’t use ‘it’, in a negative sense that is your own personal problem with the word ‘it’. Like those knights of Ni. I didn’t mean that word to be a focus point of my writing. I don’t see my cat as an object or monster, I meant ‘it’ in the sense of ‘it’ being an animal. I see my cat as special. I used the word it when referring to babies sometimes too. I think you was just looking for something to attack rather than focusing on my actually points. Or as they say a straw man argument. Something easy to knock down, as oppose to my actual points. Or you have some issue with the word ‘it’. Maybe you could of said a better word to use than cat or she or anything that could be consider politically incorrect. I mean who is she… the cats mother? Semantics in arguments is rather sad in my view, as oppose to focusing on the points made. I know my cat is a life, hence why I am vegan. I can’t really use her name all the time, as it would be confusing and to nit pick pedantically at one single word rather than look at a persons actions is to analysis in the totally wrong direction. For example you don’t take in to account my English ability or style of writing. To assume that because I use one word and don’t consider my life style or choices I make in order to help animals and people, well that to me shows lack of good judgement. Especially implying that I have growth to do and you are morally superior than me because you are better at English than me, but obviously not better at being compassionate or using logic. Or is that wrong of me to say based on a small few words you said. Maybe I should actually talk to you in more detail. I would just like to add my cat has been vegan for 4 years now and is very healthy. Very happy. I sometimes wonder if she spends to much time round me and not outside. But other than that she is very good. She is good round people. She is rescue cat she use to be really timid scared of dogs and scared of kids, now she sits there and lets them play with her. And doesn’t run from dogs so long as I am close and their not barking or she isn’t being chased. She is a good cat. I think if I treat her so horrible she would still be scared and would not come back if I let her outside. I don’t put a collar on her. She is free. I treat her with respect. I am sure many people class themselves as cat owners, rather than friends with the cat. I don’t treat her like most people would, in some sort of feminist or specialist way in which I know what is best for her. I do what she lets me do to help her. This may seem strange, but she comes to me when she wants anything. What a wonderful objective podcast! I really appreciate vegans with critical thinking skills, who don’t settle for the “trust me I’m vegan” proclamation. Will definitely be tuning in…………. It was really painful to listen to this program but I did. WHY are you picking on a person promoting vegan cat food. There are thousands of brands of bad cat food and you are choosing your time to pick On Evolution Diets? FYI: I spent the last three years with a cat that appeared to have IBD/Colits. I tried Everything but nothing worked. I finally researched vegan foods of which he is now eating and he hasn’t had a drip of poop for 2 months. I know that isn’t long, but my family spent three years cleaning up poop and trying many foods, medicine, etc. so this is truly a miracle. Evolution has been around for over 20 years, I just don’t get what your objective was? Thank you for your comment, but I did explain the focus on Evolution in the programme. Evolution came to my attention because, of the brands of vegan cat food that were analysed by Lisa Freeman and found not to be nutritionally complete, it was the only one who reacted by denying the problems rather than trying to fix them. Although Eric Weisman claimed to have fixed those problems in his interview with me, despite repeated questions by email and over the phone, he never fully explained exactly what he said he’d changed about Evolution. And as you’ve heard, the investigation discovered other problems, including Eric Weisman’s relevant criminal record. As far as I’m aware, these factors set Evolution apart from other vegan cat foods. When doing a show about vegan cats, I was not going to investigate a non-vegan brand of cat food, even if I was aware of one with a similar set of problems. It was hard to know what you were explaining because you and your co-host were so incredibly mean and condescending. You wouldn’t even let him talk when you would ask him questions. As far as his record; I’m not sure what this has to do with his cat food? He gets in trouble for practicing veterinary care of which he does better then most vets. If I had known about him earlier I would have saved myself a lot of time & money, and would have had a healthy cat. His food is sold off VeganCats, Eco Dogs & Cats, and Gary Yourofsky has it on his ADAPPT website as an option to feeding animals meat. I would hope that those of us who are vegan or processing to become vegan would support each other, find the many good in things, but it appears it doesn’t work that way with you. Gary Yourofsky also has a criminal record, for doing acts of compassion. We live in an upside down world where justice doesn’t prevail all the time. At least you had the decency to not put a rating on the food on vegguide. There are at least three 1 star ratings that have no experience with his cat food. Where is the justice in this? I wish just one of those people would have had my cat for 1 week of when he ate meat protein vs. when I started feeding him Evolution. Our three year journey with our cat who can’t eat meat protein could be a good lesson for people to think outside of the box. Also, in all fairness, if you are really unhappy with Evolution, then find some dirt on them other then his criminal record and the study you mention. He’s been around for 26 years, so with the way you spoke of him you should be able to find many stories of cats/dogs dying from his food or getting really sick. I’ll be waiting to hear. I absolutely did give Eric Weisman time to answer questions; I only interrupted when he chose not to. As you can read in the post above, his criminal convictions are for making false claims about vegan pet food, and thus extremely relevant to a show about feeding cats vegan food. An offence that was irrelevant, or against laws that are inimical to vegan ethics, would have been treated differently. The Vegan Option endeavours to be objective journalism, as you can read in the “about” section, or hear in any other episodes. I think it would be a disservice to the audience to interview a guest with Weismans criminal record and pseudoscientific claims but not challenge him on them. OK, listened to that program. There were actually two people unsatisfied with Evolution. 26 years of business and you came up with 2 people. That makes me happy actually, I was worried you were going to have at least 26 people…1 for each year they have been in business. There was another guy on the program who was trying to make a vegan cat food and his name is Adam Wilson. His company was in business for 7 years and they are no longer. He was also harping on Evolution, but he didn’t have the last word as his company is out of business. I guess I just wish I knew what the real problem is with you and Evolution? You hint that there is some other “real problem .. with you and Evolution”. There is not. I strive to be an objective journalist, with a particular grounding in science, covering interesting stories from a vegan perspective. You can read more about the values of The Vegan Option at the link I suggested. The problem with Evolution, as explained in the show, is that Weisman makes pseudoscientific claims, and did not respond constructively when Evolution was found not to be nutritionally complete. This was solid enough and relevant enough to mention. I did not set out to find unhappy customers of Evolution. That wasn’t a prerequisite for mentioning the issues. As I mentioned in the programme, I did contact the shelter that Weisman had mentioned as using Evolution. I hope you’ll appreciate this is much fairer to Evolution than actively seeking out pets who have had problems on his food. Possibly because of Weisman’s own intervention, they did not respond. “JustForThis” – Thank you for your comment. Let me restate from the blog post that Weisman plead guilty to three charges relating to breaches of a previous injunction; they were not (as you say) all dismissed; and let me restate from the show that the “metabolite therapy” he talked of made no internal sense if you’ve got a grounding in Biochemistry. Nor does comparison to some of the claimed cancer treatments you mention necessarily do Weisman any favours. Naturopath and sympathiser Steve Austin tracked 21 Gerson cancer patients over five years; only one of them survived, which is a typical rate for untreated cancer. Your absolute cynicism about the medical profession doesn’t match my experience. I could regale you with instances where my GP prescribed exercises, or a natural salve, or something else that doesn’t make big pharma any money at all. Or you could look at the advice on mainstream sites like nhs.uk – if you’ve got a cold, for example, they suggest (yes) analgesics, but also steam inhalation and even supplements.